I love galettes for their simplicity and beauty. If you ever have fruit that is about to go bad, a galette is easy to make. I bought a whole bunch of nectarines from Costco and they were ripening way too fast to eat. So a galette seemed in order. I love the flavor of nectarines and blackberries together. The juices that run are unbelievably beautiful and tasty. I adapted this from a Smitten Kitchen and Bon Appetit recipe. Enjoy! I am a sucker for Aloo Gobi. Almost every time I go to an Indian restaurant I order it. 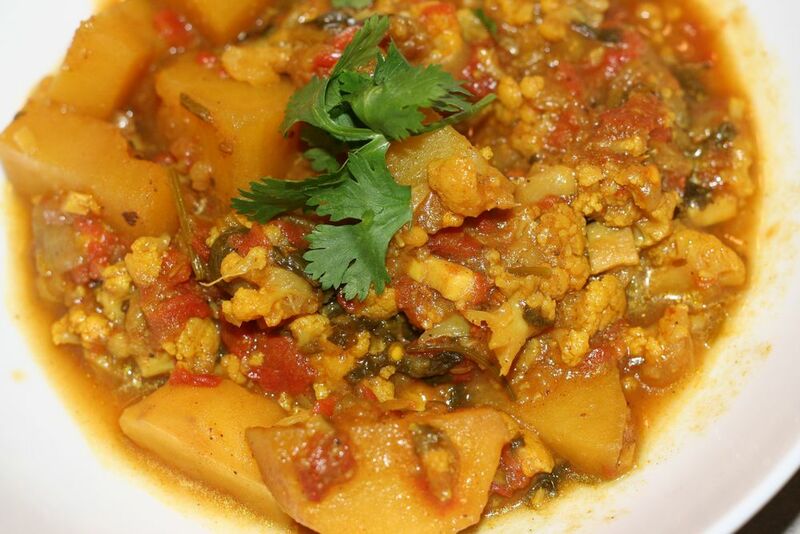 I love how you can turn cauliflower and potatoes into something amazing with a few spices. It's just darn good! If you want a quick and easy salad for dinner during the week, then this is the salad! If you have leftover chicken, then this is the salad! My husband and I LOVE this salad! He kept asking for it every day. It's that good! The salad dressing goes well with just about any salad in my opinion. I like to keep it on hand in a large mason jar in the fridge for just about any salad or steamed vege that I make. Enjoy! Combine all ingredients in a jar with lid or any tupperware with lid. Shake vigorously. Shake well before pouring over salad, toss, then serve. If you don’t have any rotisserie chicken just boil a chicken breast for about 20 minutes. In a large bowl, throw all the ingredients into a bowl. Don’t forget lots of sesame seeds. Pour some salad dressing to taste and toss. Put salad in serving bowls and garnish with more wonton strips and sesame seeds. It's that easy! And so good and addicting!